Charlie Watson says the ultimate combo is Good Food and Hard Work. 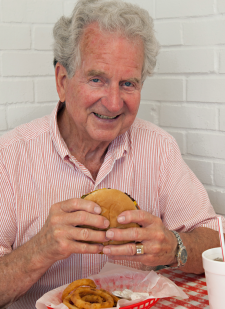 At peak, Watson owned and operated over a dozen food operations in North Texas & Southern Okla.
Watson, eighty-one, and his wife Pat, eighty, sat in a booth at Watson’s Drive-in in Denison one warm summer afternoon and had hamburgers and shakes for lunch. While they ate, they watched as grandson Brandon Watson flipped burgers on the same flattop grill they used when they started in the food business six decades ago. At its height, Watson Enterprises operated more than twenty operations in North Texas and Southern Oklahoma. Charlie Watson grew up in Denison where his father worked for the railroad. He graduated from Denison High in the early 1950s when the school still occupied the venerable old building on Main Street just across the street from where Watson’s Drive-in still stands. While in school, he met his wife, Pat—she was Patsy Ruth McCarley, the daughter of a local dairyman—and as soon as they graduated, they got married. He was eighteen; she was seventeen. The couple headed west to Levelland, where Charlie went to work in the West Texas oilfields. Three years later they came back to Texoma in response to an offer from Pat’s father to take over a dairy farm he had acquired in Durant, Oklahoma. The Watsons ran the dairy for five years. It was a hard life, with long hours and hard work, but one which made a decent living for the young couple. That ended when changes in government regulations limited their operation to selling milk only in Oklahoma. With half the market gone, the dairy business soon faltered, and Watson started looking for something else to do. On a trip to Sherman in search of a fender for an old car he was trying to sell in 1954, Watson found what he was looking for. He stopped at a brand new KN Root Beer stand located near downtown and ordered a drink. One quaff from a frosty mug and Watson was hooked. “I knew I had to get into the root beer business,” he said years later. Watson had stumbled into not only an idea, but an opportunity as well. The owners of the stand were from Minnesota, and they were looking to sell out and move back north to escape the torrid Texas summers. Charlie and Pat found the money needed and bought the stand, and the Watsons were in the root beer business. The building that housed the Watson’s first operation was demolished when U.S. 75 was rerouted and rebuilt a few years later. Downtown Denison also had a KN stand, also owned by displaced Northerners who longed to go home. It was across the street from Denison High School, with a built-in customer base of thirsty teenagers. The Watsons soon acquired that business, too, and found themselves thrust into the role of pioneers in the fast-growing business of fast food. From the start, it was a partnership. “You see, every good man in business has a good woman pushing him,” said Watson. At first it was just a means to make a living, but pretty soon the couple found other reasons to like the business they had embraced. 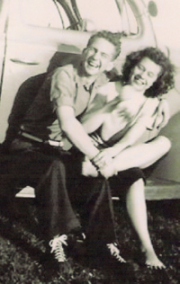 “The dairy business is just not that personal,” Watson said, “and I decided if I ever got into another business, I wanted it to be a cash business.” The Watsons found they liked dealing with the customers who came to their root beer stands every day, and as for cash, at their first store in Sherman in the mid ‘50s, the couple sold more root beer than any other two K&N stores combined in the entire country. That was fine, but the Watsons soon discovered that the root beer trade slowed down considerably with the onset of cooler weather. They needed something else to offer. Pat figured she could cook pretty good hamburgers, so she developed the original hamburger they sold. It was good and so successful that it hasn’t essentially changed in more than fifty years. “It all starts with the meat,” Watson said. And they were particular about the meat. Watson would go to the Anders Meat Company in Sherman and choose specific cattle to be butchered and turned into the makings of their hamburger. Their expanded menu garnered a lot of trade from the school kids in both Sherman and Denison, and the kids spread out and spread the word. As the lines got longer, along with the wait for service, the Watsons worked to turn a burger quicker. They figured that if the kids could bring the correct change, everything would go much quicker. They got it down to a science. The root beer stand was rechristened Watson’s Drive-in, and along the way the burger business became a kid business. The business continued to grow as the Watsons bought the old Palmer’s Drive-In on Austin Avenue (now Sali’s). It was their first Watsonburger location, and with that expansion, Watson knew they had to raise their game. He would stay late at night in the kitchen, sometimes until two or three in the morning, and run experiments on burgers, hotdogs, and the like. “I threw away tons of food trying to get it right,” he recalled. Out of those late night sessions came a burger with a six-inch patty, three tomato slices and five pickles. The Watsonburger had landed. In time there were Watsonburgers in Sherman, at three locations in Denison, in Bonham, down south in Garland and Frisco, and in Oklahoma in Durant and Ardmore. As the empire grew, the Watsons kept trying new things. Charlie Watson and Pat Ruth McCarley always made a good team. When they opened the “Super Watsonburger” in Ardmore, they bought a brand new curly-fry machine. They sold six hundred pounds of fries the first day they opened. By the time the store opened the next morning, Watson had modified the machine so it would turn out curly fries even faster. As the businesses grew, so did the Watson family. The couple had four kids, two boys, Jamie and Kim, and two girls, Tana and Kathy. At one time or another, all the kids worked in the stores. “We never made them work there,” Watson said. “I told them they need to do what they want to do.” Most of them stuck with the family business. The Watsons’ grandson Brandon runs Watson’s Drive-in today, and customers, the older ones at least, are quick to speak of the time they first ate at Watson’s. They share their stories, tell him that’s where they met their wife or husband many years ago. “Even my mom and dad met here,” Brandon said, and smiled at the irony. I loved the mushroom swiss burgers. I hate that Sherman stand closed. I’d love to know where to get one or to have the recipe to make my own. Any info would be apperciated. Sure do miss it. Thank You. Had my first Watsonburger today at the one on 120 in Denison. Excellent burger and perfect french fries.